I don't know how to summarize what i read. Everything seems so important! A few days ago when i spontaneously walked into Borders, i thought of buying a simple small 50 pages kinda book to freshen up my mind as the current book that i read was too 'serious' and too thick. I ended up feeling contemplating; to buy GRIT by Angelina or this book. Both are more than 200 pages and exceed my initial budget by twofold. 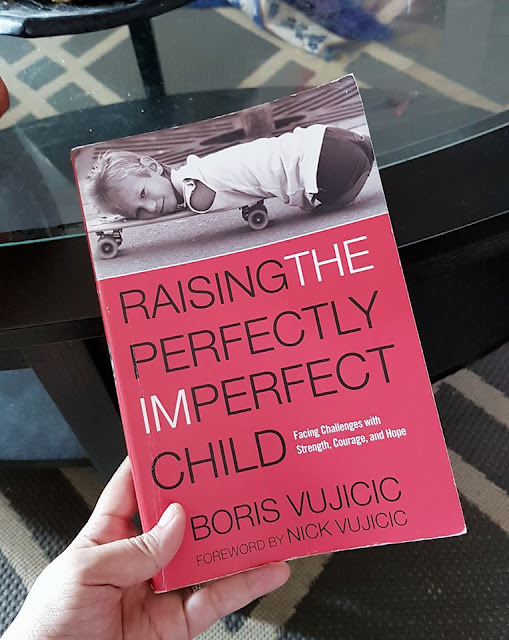 Raising the Perfectly Imperfect Child - as the title suggest, is looking at Nick's family life from the perspective of a father. Yes. It was written by Boris Vujicic which made me think, i (eventually we) may be able to relate some of the content with our current circumstances. True enough, i find every single bit of phrases and sentences very much meaningful and to some extent; prompt us with future challenges we might face. 1. Glass is not hall full or half empty; it is always full from the very beginning. Why only look at water that fill in the glass when you have oxygen that fit in too? 2. Every single kid is unique; able or disable is just a label. You could nurture them to the highest point possible if you believe on their strength and purpose of life. 4. Love is the most powerful tool, gift, skill, things you could ever shower your kids with. As written by Nick in his foreword; those who growing up without loving and supporting parents has far more overcome than he did. 5. Believe in your child. Let them be our teacher. But never make them a superior. They have responsibilities and need to be counted for their actions. 6. Raise all children equally. Strong foundation will help to stir all situations and everyone must first learn value of fairness, equality, justice and setting boundaries. 7. Sometimes we as parents ask for a miracle without realising that the journey itself is a miracle path paved for a special family. Treat it with honour and try to inspire as many people out there and never loose faith in Allah. 8. Each father and mother has major influence in a child's life. Take charge, be adaptive, working together with style that suits the family and stay together as a family. 9. Keep your love alive as a husband and wife. You may get too stress and ovewhelmed with some situations, but remembering the affection that brought us together is important. Go out for a date. 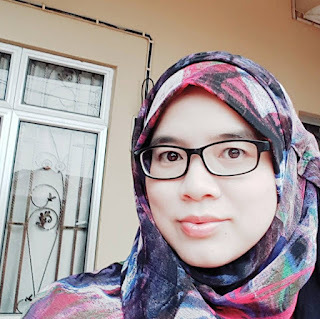 Try to get a few minutes daily as a couple without discussing about challenges, bills and expenses. 10. Faith. Faith will keep you alive. Know what is the purpose of your life. It helps you manage everything else. Even at the lowest point of your life, keep your faith to your heart. Time will heal. I strongly suggest parents, i mean any parents. If you could, please read this book. And you know what, it is somehow inspire me and ingnites the spark to continue writing my third book which i have abandoned for almost a year! !